Lets see how a Raspberry pi based content delivery solution can be developed for educational institutes or anyone who needs it. Educational institutes have primary objective to enable learning through various interactive programmable delivery of content. The setup can be installed in lounge areas or even in school classrooms. Content can be customized as per need and pre-added to a batch file based application that functions like a jukebox that open the YouTube video link using the default internet browser. Making the content delivery changes will be a custom requirement and can be remotely administered. The prototype application can be administered by modifying the configuration files that directly download content from LAN or any other source. FreeBSD installed on the sd card and Apache based web application for each school/university as per need. Once device is started it boot the OS and start the web app on display with default player. Custom prototype application initially can be installed for demonstration that will play the YouTube demo videos. 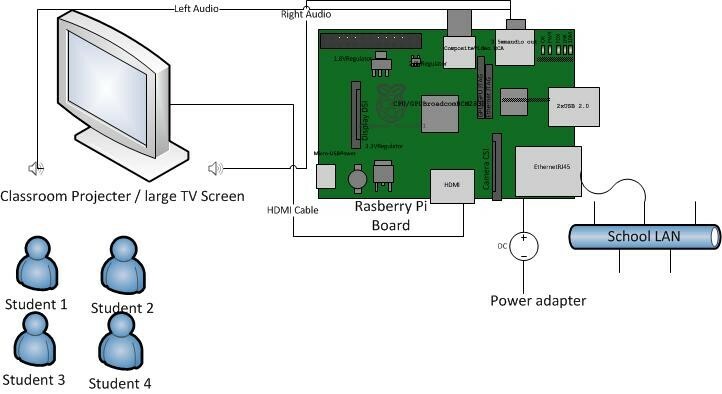 Block diagram consists of Raspberry Pi device (with casing) connected to the LAN. The device is connected to a TV and speaker. When the device is started it will booted with output to TV and speakers as per the configuration setup. When the device is switched off no video is played.